You can text syncya to 25827 to receive text alerts on the titles as they become available. • Downloads are in MP3 format, hosted by OverDrive, and are Mac and Windows compatible. • Downloads will operate through OverDrive’s Media Console. • Most listening devices are supported. Check here for the full list. • Starting June 23, each SYNC audiobook will be available for download for a period of 7 days (only). 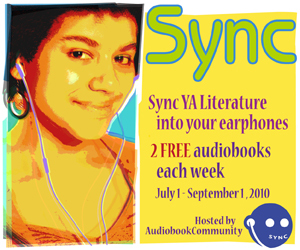 Go to the SYNC group on Audiobook Community to get the download links for each title within the seven-day period. 2 comments to Free YA Audiobooks for the summer! Wow that’s a heck of a list! I agree, I can’t wait to get them all downloaded!